This issue’s article (at the end of the newsletter) is by Sari Gallegos a home schooling mother in the USA who took the most recent Teacher Training Course. Note: we know some teachers of younger children may not need or wish to do the full course, and so for the first time we are offering a shorter course (5 weeks instead of 9). Please see the above link for details. We are grateful to Sivaram Pasapati from Japan for taking the exercises from the Manual and putting them into a separate publication. This way teachers can give out a ‘Homework Manual’ or parts of it to their students. We have done a batch of very young students of age group ranging from 9 to 12 years old during last 2 months in summer vacations. It is my first experience with such a young participants in Vedic Maths. Good thing is that their response was amazing. Students were in standard 4, 5, 6 and 7. At the beginning of the course, the youngest student was able to do multiplication of maximum 2 digit number with single digit number using conventional method but now he can do n digit multiplication in single line very fast with full confidence. These students not only do multiplication very fast in single line but subtraction of large numbers very easily. They know how to check their answers using digital sum method. They also learned addition and straight division. One more thing we have done in that and that is tables, they learned the tables up to 100 mentally without writing it. We taught them tables up to 100 with some activities and with some practice and each one of them are confident in table till 100. Multiply the number with its first figure (proportionately sutra). Multiply the figures together and add this sum to the previous result. This forms the first part of the answer. Square the last digit and it forms the last part of the answer. If there is any carry from this squaring, carry it to the first part of the answer. 62 = 36 , where 3 goes as the carry to 310 and 6 remains as the last figure. 82 = 64 , where 6 goes as the carry to 224 and 4 remains as the last figure. Note: The method also works fine with squaring of larger numbers but gets a bit more time consuming. We are starting a series of fun methods from Michael Empeigne. Find the average of the first 20 multiples of 7. The sutras involved are "By one more than the one before" and "Proportionately". I recently had the pleasure of participating in the Vedic Maths Teacher Training Certification Program. I have been a homeschooling parent for a quarter of a century, and it has been longer than that since I last studied mathematics. I did my time, knew the basics, tripped my way through college calculus and forgot anything I didn’t have to remember. Math, in my viewpoint, was a necessary survival skill, an accomplishment to claim and nothing more. Luckily, my three oldest children had a natural interest in mathematics, and were open and enthusiastic learners, as mathematics was the most “formal” of our homeschooling subjects. After introduction to the basics, their natural curiosity led them to higher and higher levels of studies, until at some point, all three moved beyond my capacity to teach and comfortably continued their studies in college level math courses. Teaching my three older children (two daughters and a son) was never a struggle, and I was completely unprepared when my two youngest children did not share their enthusiasm. I tried everything I knew to re-frame math as interesting and to put an end to the sad expressions on their faces when we settled in to our lessons. Nothing worked, and I could see the girls were starting to actually despise math. We focused on other studies and I avoided teaching math directly with them for over a year, but they were getting older and putting it off did not change the fact that they needed to learn mathematics to navigate into adulthood. The extended break added a new complication. They had forgotten the basics, and now they needed to gain confidence that they were capable of understanding math. When I first learned about Vedic mathematics I recognized Bharati Krishna’s insights as a work of art. Inspired, I began incorporating Vedic methodologies into my daughters’ learning plans. My girls are extremely creative and they reveled in the historical aspects of Vedic Principles. For the first time, I saw smiles as we started to study the sutras together. I knew I had found the path to reclaiming math for my daughters, but there were still challenges. The techniques and thought patterns were new to me, and in essence, I was learning them alongside my daughters. I kept forgetting the principles and they were having to remind me. What the girls needed was a teacher, not a study partner. It was time for me to step up to the challenge, and seek out tools to support their learning. When I saw the Teacher Training Course as an option of study, I was nervous and excited. Here was an opportunity to not only learn the basics of Vedic Mathematics myself, but to gain the skills to articulate the Vedic methodologies and aid the girls in their progress. I was fulfilling an obligation, as a homeschooling parent, to seek out the tools to support their learning. What I didn’t realize, was how enjoyable the study of mathematics can be when approached through this natural philosophy, or how addictive it can be to finally understand how and why mathematical relationships define the patterns of our lives. The program of study for the Vedic Mathematics Teacher Training Course was amazing. It was well thought out and woke up my mathematical mind, like the unfurling of the petals of a flower. Gently, so the connections stay strong and do not break. I was immediately impressed by the quality of the webinars. The pace and clarity of the lessons made them a pleasure to view, and the ability to pause, rewind and work on examples allowed me to really understand the principles and coherency behind the techniques. I found myself looking forward to having the time to review them. The class required participation in an online forum. I had no idea what to expect from a forum on mathematics. In truth, I found the unexpected. I found a community of creative, compassionate and encouraging students sharing their discoveries and their challenges. I found a professor, Ken Williams, who was insightful, patient and optimistic of our abilities to master the lesson plans. Not only did he promptly respond to all of our questions, he also provided challenge questions designed, I believe, to prod us into discovering our own natural pathways to understanding mathematical relationships. It worked! As the material slowly grew in complexity, my confidence grew alongside, and I found myself fascinated by Pythagorean Triples, discovering patterns and relationships before they were presented, and even considering Calculus as a subject I could potentially navigate. I looked forward to my lessons, and even to the tests, and I enjoyed watching my fellow students grow in confidence. At the end of nine weeks, with full time work on top of my studies, I was exhausted, but proud. With detailed individualized support from Mr. Williams, I managed to create my first lesson plan and also to introduce Vedic Principles in lecture format to a group of adults. Most importantly, I felt confident in the material I was presenting. The course has changed, not only my daughter’s attitudes towards mathematics, but my own. 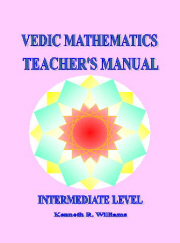 I have amassed a huge file of Vedic resources and articles and find myself reading about Mathematics, for pleasure, and comparing our standard curriculum to the more natural Vedic methods and feeling forever grateful to have been accepted as a student. My journey is only just beginning. Mathematical patterns are everywhere in nature, and I have finally re-integrated the study of math with the study of life.